3D Paint – a prototype for CAD 2027? Remember the time when quality typing on mobile device was only possible using physical keyboard. Nokia phone keyboard was a mainstream and Blackberry Qwerty keyboard was a luxury. The things started to change with the introduction of iPhone and other modern mobile devices as we know them now. It took 10 years, but the difference is huge. The notion of making things easier is a lifetime challenge for most of CAD vendors. I remember “making CAD easier” is a topic coming years after years. CAD systems made a huge improvement for the last 20-30 years, but at the same time, it is still the same “complex” tool. According to Jon Hirschtick founder of Soldiworks and Onshape, CAD industry is halfway done. There’s no problem in CAD that’s been completely solved yet. CAD systems still aren’t fast enough, they’re not easy enough, they’re not robust enough or reliable enough. All of the core issues in CAD are still there – and I think as an industry, maybe we’re halfway done. I’ve been skimming news articles over the weekend. The following one by Microsoft caught my attention – How Microsoft plans to make 3D building mainstream in Windows 10. Microsoft Paint? 3D? I missed the announcement of Paint 3D. Paint 3D was a surprise. 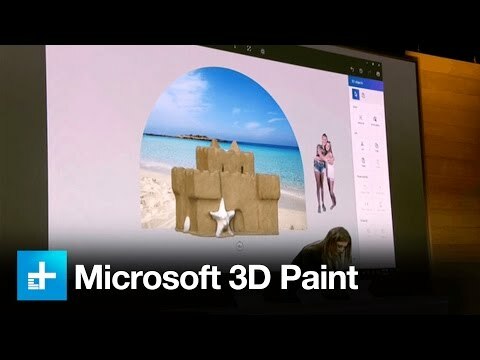 Even longtime Microsoft watchers had no idea the company was working on a 3D spin on Paint, and it seemed like a left-field choice for most consumers. But after diving into Paint 3D in the Windows 10 Creators Update, I can say it actually makes complete sense for Microsoft. It’s an ideal way to introduce a new generation to building and thinking in three dimensions. And according to Megan Saunders, Microsoft’s head of 3D experiences in Windows, that’s a skill that will be particularly useful with the rise of VR, AR and 3D printing. “If you look at all the AR and VR devices, they have this amazing potential,” Saunders said in an interview with Engadget. “But it’s really the content and the software that will show up across all those devices where there’s a real huge opportunity. And, unfortunately, the state of the 3D market now and then is especially broken.” We don’t think much about working with 2D content these days — snapping a photo and posting it on Facebook is pretty seamless. But when it comes to creating and sharing 3D content, it’s another story entirely. The thing that struck me when I was watching the video was related in fact to how it can change the mind of people working on new content creation. I’m not speaking about professional mechanical engineers, but about kids and individuals interested to develop 3D content. In a traditional mind, 3D content was always hard. This is how I remembered it for many years. It required complicated tools, long training process and whatever else (I don’t know why) to start doing it as easy as 2D sketches. What we see here is an attempt to change it. I don’t know if Microsoft will succeed. It is certainly not to first attempt to do it, but it is address the right audience – people that not using CAD systems today.